X-ray is invisible to the human eye. So how does it become an image of teeth that we can see and diagnose on the screen? The physics involved and the electrical engineering achievement behind a dental digital x-ray sensor are very interesting, but for the purpose of the discussion, we’ll focus on the high-level schematics. First, x-rays behave similar to light so it can be directional and will scatter when hitting materials that can reflect or block x-rays. Just like regular digital photography where you need sufficient lighting and a proper focus to capture a clear image, you need sufficient x-ray dosage (intensity) and position the x-ray generator at a proper distance that meets the focal point of the specific x-ray generator you are using to capture a clear image. A good digital camera has good optical lens and a good sensor inside to produce a clear and hi-resolution image. The same principle applies to dental digital x-rays. The difference, of course, is that what is optic lens to a camera is a pair of scintillator and optic lens for a sensor. 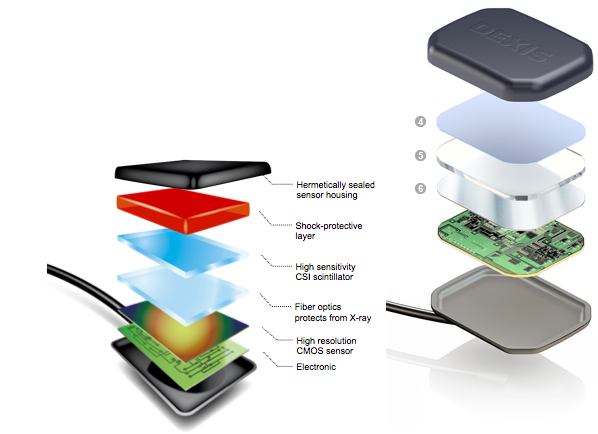 Below is the typical construction of a dental digital x-ray sensor. The scintillator is coated with Caesium Iodide (CsI). This chemical compound, in the simplest form of explanation, will light up and create a "substrate of light" when the x-ray hits it. The optics right behind the scintillator will concentrate and enhance the “substrate of light” from the x-ray exposure and direct it to the CMOS sensor that’s next in line. In fact, the CMOS sensor used here is basically a special make for small area imaging, but the technology is no different from the same sensor inside a regular digital camera. After this process, the x-ray is now in the visible light spectrum and can be displayed by the computer. NOTE: dental extraoral digital x-rays, such as a Pan or a Ceph, is quite different in terms of construction of the equipment, but the principle of how the equipment operates to acquire an x-ray is almost identical to an intraoral sensor. Thus, to simplify the discussion, we are basing this article entirely on dental intraoral digital x-rays. Because converting the invisible x-ray to visible light using the processed illustrated above happens very fast, and the “substrate of light” fades very quickly, the post-processing of the captured image to first negate it (the substrate is practically a negative image of what you see), enhance clarity, and improve diagnostic quality is always done by the computer. This is where it seems mysterious to the dentists why the same sensor, same x-ray head, can produce completely different images in different software. Let’s break down the factors, and see why good imaging software and a knowledgeable technical team behind the software will ensure good image quality. All dental digital x-ray sensors are capable of producing 8, 12, 14, or 16-bit greyscale. As soon as the bit level is 12 or above, the difference in quality becomes minor because unlike medical x-rays, dental x-ray exposure time and intensity (except 3D CBCT) are much shorter and lighter so there are usually not that many bits to capture to begin with. However, 8-bit sensors are on other hand noticeable lacking in details. Therefore, selecting a sensor that is able to produce 12 or more “true” bit level on the hardware side is important. Although it’s quite rare to see an 8-bit sensor as of 2013, it is important that you verify with the manufacturer or inquire with us that the bit-level is produced at the hardware level, not emulated by the software. A higher bit level will always be better, but visual difference will become difficult to notice after 12-bit, which sometimes the cost associated in getting a sensor with a higher bit level doesn’t justify. NOTE: all dental digital x-rays will be stored in a 16-bit greyscale image file format regardless of whether the sensor produces the image in 8, 12, 14, or 16-bit greyscales. You probably have heard that electronic displays cannot show more than 8-bit greyscale (256 shades of grey), which is a fact, and makes perfect sense as human eyes cannot distinguish more than 72 shades of grey. However, good imaging software will accept a 16-bit greyscale image, process it, and then downscale it to 8-bit using a technique called Window Leveling at the last minute before displaying it. It is during the processing, when there are 16 “bits” of greyscales (216 of different greys, which is equivalent to 65,536 shades of grey), the software can do precise computations to bring out the subtle details and show them in the final down-sampled image to you that may have otherwise be lost. The post-processing and down-sampling of a 16-bit image file into an 8-bit image display can either be done by the driver (a piece of software supplied by the manufacturer), or by an imaging software system such as ClearDent. 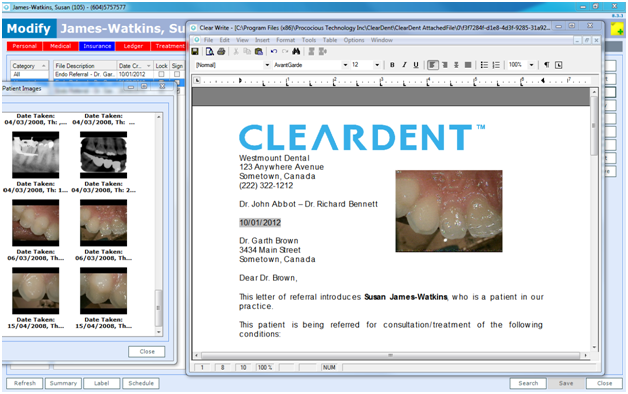 Typically, the manufacturers process their own images well so most imaging software, including ClearDent, simply let the manufacturer process the images with its own driver, and just add a small amount of gamma correction to adjust brightness and contrast as a polish. In fact, some dental digital x-ray manufacturers only recommend image processing using their own drivers and the imaging software should simply adjust the gamma to avoid over-processing that actually can make the image look worse. As you can see, ClearDent greatly enhances the original Gendex images. In other words, to bring out the best in a dental digital x-ray, you need not just a good software system, but also a knowledgeable team. The ClearDent team, through its years of experience, is able to know when it’s best to setup ClearDent Imaging to automatically adjust images slightly (leave the heavy lifting with manufacturer’s driver) or significantly (does its processing to greatly enhance clarity). 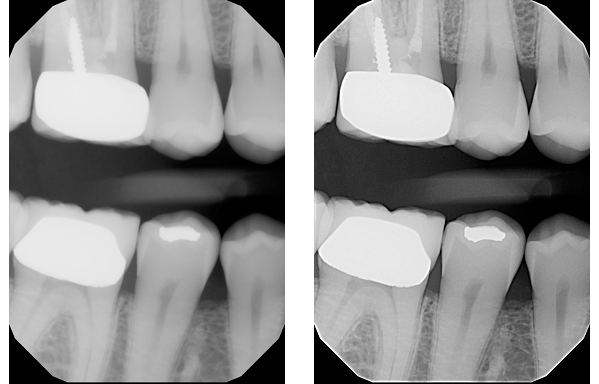 We’ve spent quite a bit of time in demystifying the schematics, technologies, and the relationship between the hardware and the software on dental digital x-rays. They are very interesting and represent a milestone in dental technological advancement. 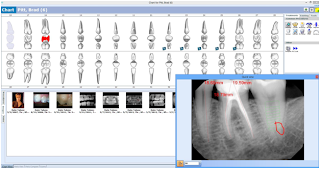 Further, digital x-ray system is an integral component in a successful paperless dental practice. But here is something that we’d like to share from our years of experience: imaging software not fully integrated with your practice management and digital dental record software won’t do you any good in the long term regardless of how well the images may look. We’ve seen quite a number of dental practices that had the imaging system separate from the rest, and then only to realize a few years down the road that it became difficult to match up or cross reference patient’s x-rays with charts, time consuming to incorporate digital x-rays in an email or a letter to another dental professionals, convoluted and overly complex backup requirement, and so on. They eventually turned to us for help but there is no silver bullet in data cleanup. We can only reduce the amount of manual work required to clean up the duplicates and re-establish links between a patient chart and the x-rays using clever programming tricks, but it's never 100%. Ultimately, dental practices in this situation still have to do some manual work afterwards. The good news is, of course, there usually are not that much left to do after we’ve done the electronic conversion. Thus, a word of advice to avoid the hassle 100% – whatever solution you chose, make sure you have the practice management, digital dental record (charting, documents, audits, etc. 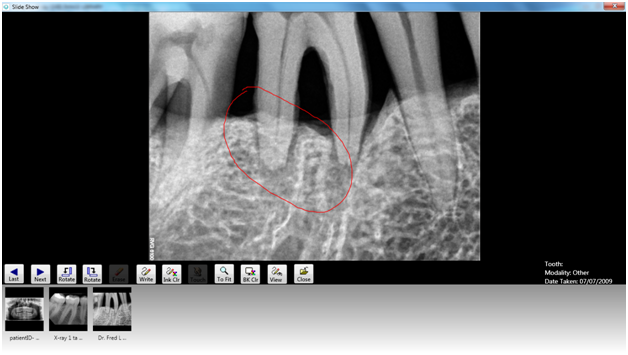 ), and your dental imaging software all integrated. 1. Charts, Notes, and Images are integrated and can be accessed and viewed in one place, on one screen. 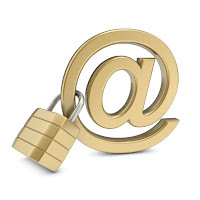 2. Letters and images are integrated and tracked in the audit for legal record keeping purpose. Figure 4: Fully integrated Imaging and Document creation, management, and tracking. 3. 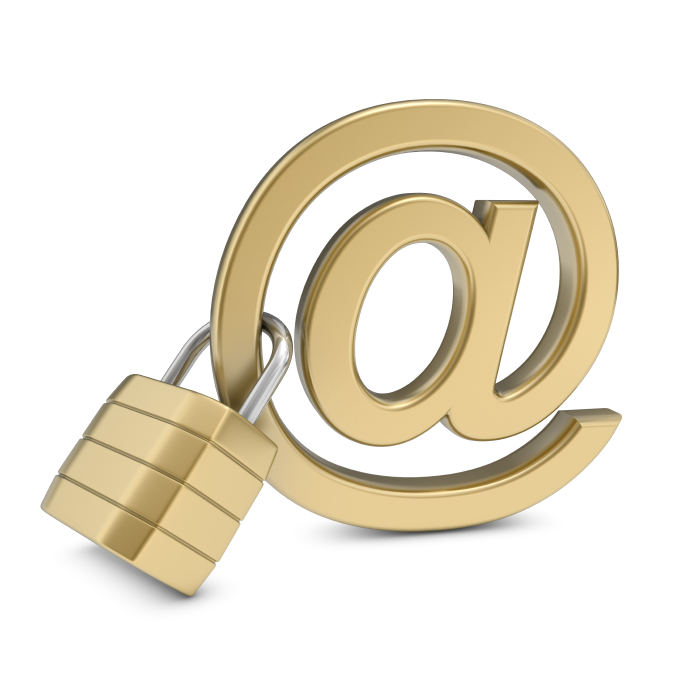 All letters and images emailed can be encrypted to comply with privacy legislation. 4. Easy to capture, easy to present: ClearDent implements auto-capture and auto-labelling functions to help streamline the workflow for image acquisition. Better yet, we also provide you the ability to use a touch screen monitor or a tablet to present the x-rays to your patients. 5. Open: ClearDent will work with any digital x-ray systems – you’re not locked in. 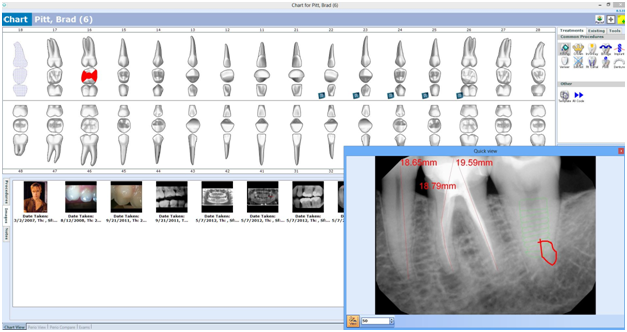 Further, if you have special needs, ClearDent has opened its platform to allow premiere imaging system such as those with functions for specialists to integrate with us. Bringing you the best of both worlds. To find out more about how we bring together digital x-ray, electronic charting, legal record keeping, and practice management together into a paperless dental practice, feel free to visit our website or simply send us an email. We will be very delighted to have a candid discussion with you about your needs and share our knowledge and experience of successful implementations with you.